Lighter evenings, warmer days, new habits. Yes, it is the time of year to overhaul our habits, we all have the power to change or create new habits and a new season is the perfect time to start. It is so easy over the winter months for your weekly yoga practice drop to one class a week, or once every alternate week. By changing our mindset, we can consciously practise and choose our behaviours. By telling ourselves we will get to yoga twice a week and planning that time into our diaries, then by setting a reminder on our phones so that we leave the house or work on time to attend the practice, this behaviour itself becomes the habit. The benefits of changing your habits will leave you feeling calm, in charge of a situation and will save you so much stress. By understanding how our habits are formed we can create positive, healthy and active mindsets to make the most of our days. 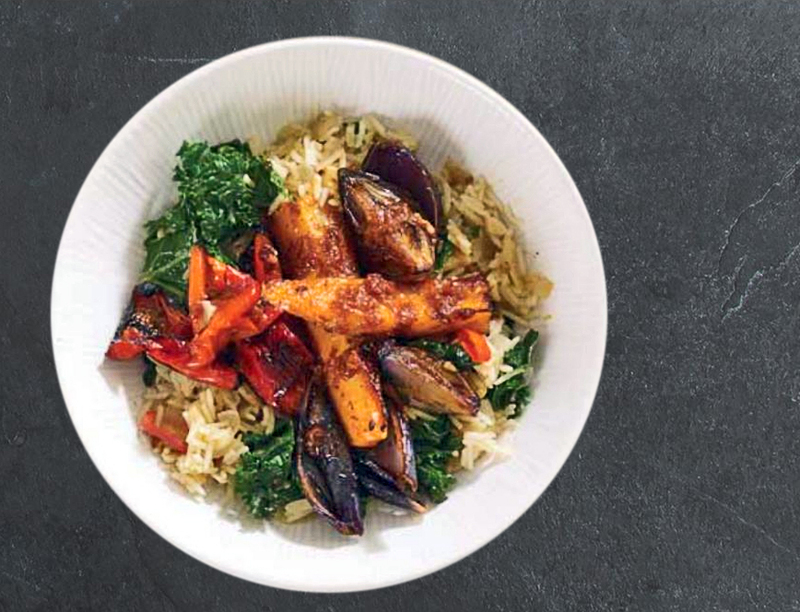 One of my favourite foods is kale, I love all greens, but I just love the depth of kale and this recipe with gorgeous harissa just hits the spot. 100 - 250g kale (I prefer black kale and I take the stalk out leaving just the leaves), chopped. Heat the oven to 200c and put the squash, onion and pepper on a baking tray, toss all the ingredients with the harissa and season. Pop in the oven and roast for approximately 30minutes until soft. Whilst this is cooking heat the olive oil in a saucepan over a medium head and add the onion, ginger and chilli, cook for 5 minutes until the onion is soft, then add the garlic and cook a further 2 minutes. Season and then add the kale, rice and 225ml of the stock, cover with a lid and cook as per the rice packet instructions adding extra stock as required. To serve pop the roasted veggies over the top of the rice and add a little greek yogurt. 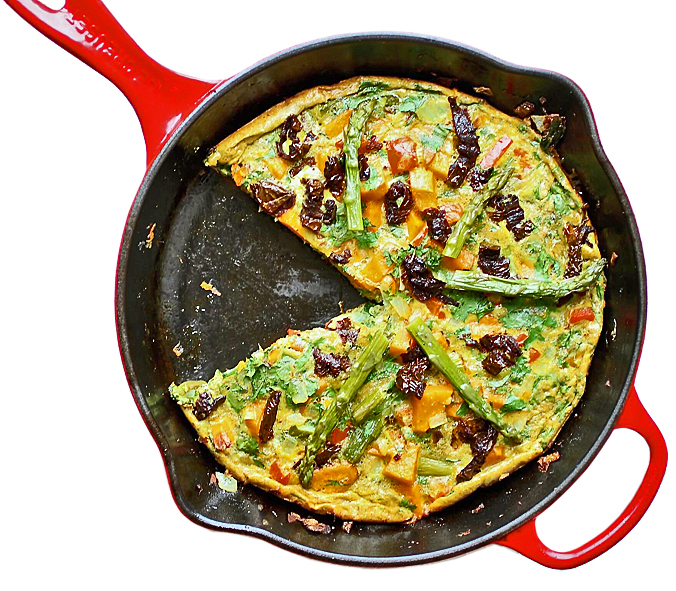 Complicated recipes don’t help many people sticking to healthy eating, but this simple healthy frittata recipe is bursting with whole foods, protein and nutrients plus Asparagus, which contains gut friendly fibre that actually stimulates the growth of beneficial bacteria in the large intestine. Bonus! Heat the oil in a non-stick pan and sauté the onion and garlic for 3-4 minutes or until transparent, add the red pepper and continue frying for another 4 minutes. Set aside. Meanwhile, in a mixing bowl beat the eggs. Add sea salt, black pepper, turmeric, cumin and mix well. Add the coriander, sun-dried tomatoes and the cooked veggies. Mix again. In an oven proof fry pan or dish add the egg mixture, arrange the asparagus spears on top and cook for 10 minutes or until cooked through. Detox Truffles, What’s not to like? 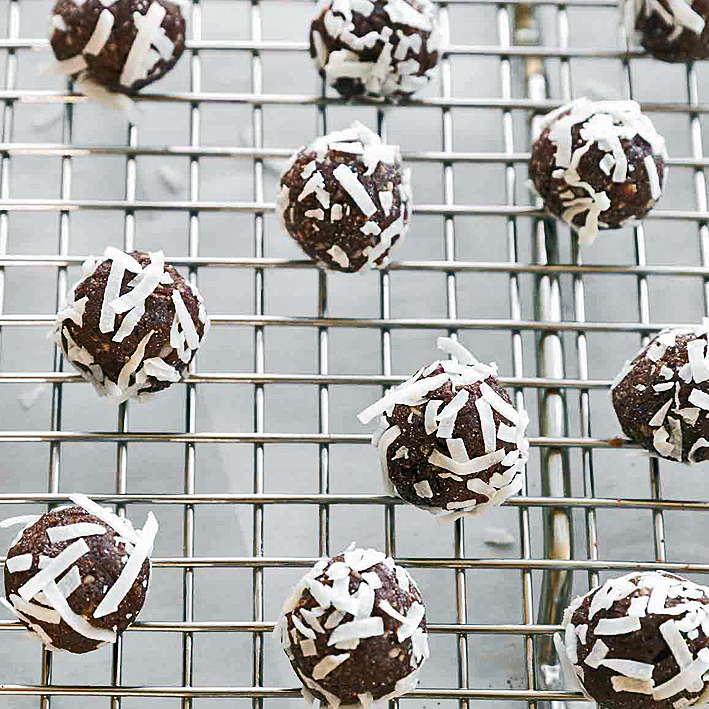 These raw, three-ingredient truffles are the perfect bite to satisfy your detoxing sweet tooth. awesome for sorting out those cookie cravings. Blend your dates, cacao and coconut in a food processor until nice and smooth. Wet your hands with water and roll your mixture into 24 small balls (about 1 teaspoon each), coat by rolling each one in some shredded coconut. The week started with Blue Monday and now it is Friday and we are nearly at the end of January, whether you have been doing dry January, Veganuary or started your fitness regime it has been a long month. 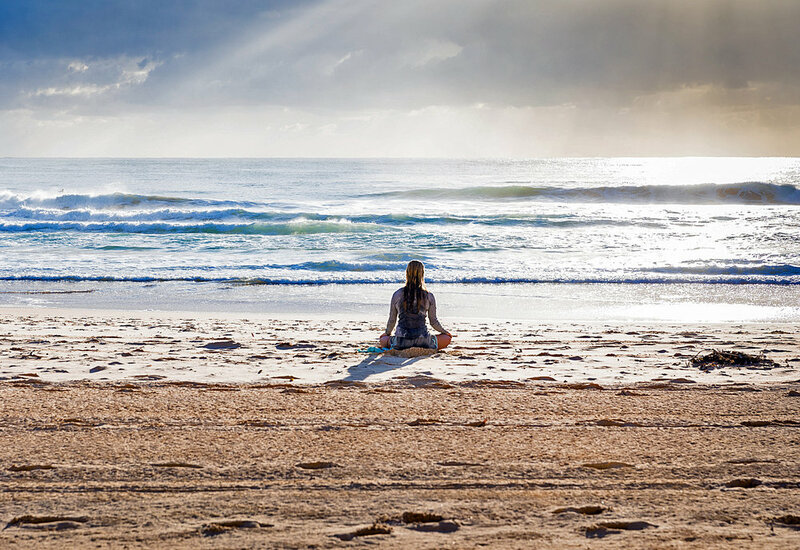 When the weather gets cold I find it helps to meditate and take 10 minutes in my day to contemplate, set my intentions and goals for the day. This helps me to stay focused and gives me energy and the ability to stay happy when the days are dark, think of the bright sunny days ahead and to strengthen my mind against any negative thoughts. So if you are doing any regime this month and have got to day 25, pat yourself on the back, give praise where it is due. The days will get longer and warmer and you have given yourself a healthy start to 2019. 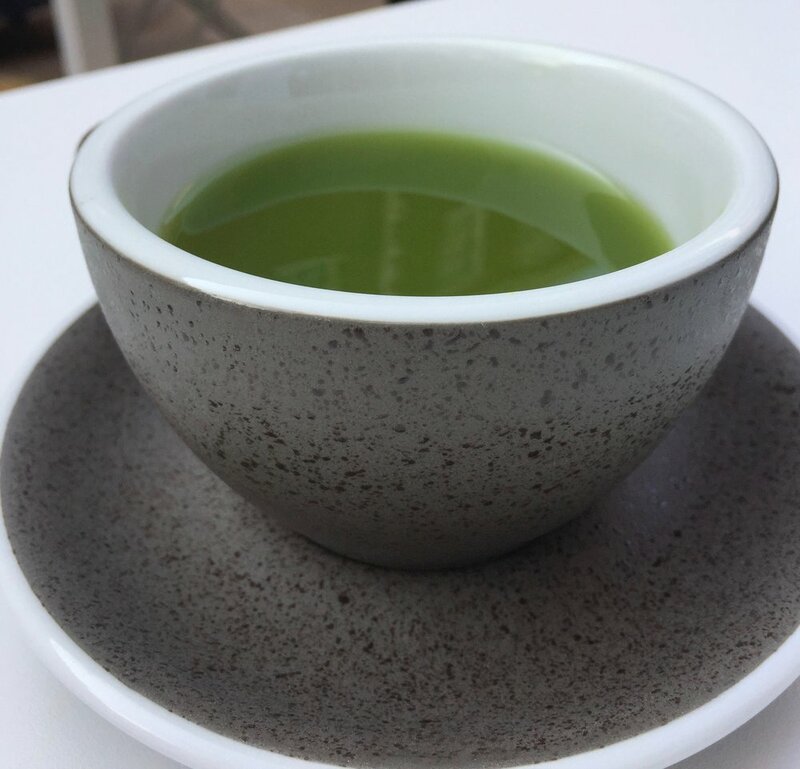 We all love a cup of tea, whether you enjoy a tea bag with milk, black tea, white tea or a green tea which I know I enjoy after a yoga practice, but, have you ever thought about the health benefits, or how It is collected, or what it even looks like. Tea contains caffeine, flavonoids, vitamins and minerals. Caffeine stimulates your central nervous system which increases mental alertness, reduces fatigue and improves blood circulation. 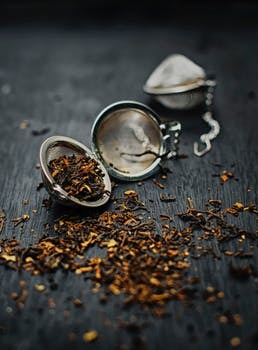 Flavonoids are an excellent source of antioxidants and tea has a good source of manganese, zinc and vitamins B, C, E and K, plus it has a natural source of fluoride which is good for our teeth. The tea plant is an evergreen shrub of 1 to 3 metres tall and when it is harvested, the small tip leaf becomes white tea, the next 3 leaves are green tea and finally you have the black tea. All tea is good for you and comes from the same plant, it is how it is processed that produces, white, green or black tea. We should all enjoy a good cuppa and to add a little extra health, add ginger for digestion or maybe enjoy a cup of Marsala Tea Chai to warm you up on these cold January mornings. The second week of January, the resolutions are starting to get a little harder to keep up, habits are slipping back into our life. As the weather gets colder we just want to hibernate in front of the fire with big woolly jumpers watching box sets. Don’t give up, this is a wonderful time of year to begin a new journey with 300 plus blank pages ahead of you. It is a time to dream of holiday destinations, detox the home or office and start your healthy journey whatever direction you feel that journey needs. It is exciting because you have the time to develop these new healthy habits which will then last you a lifetime. 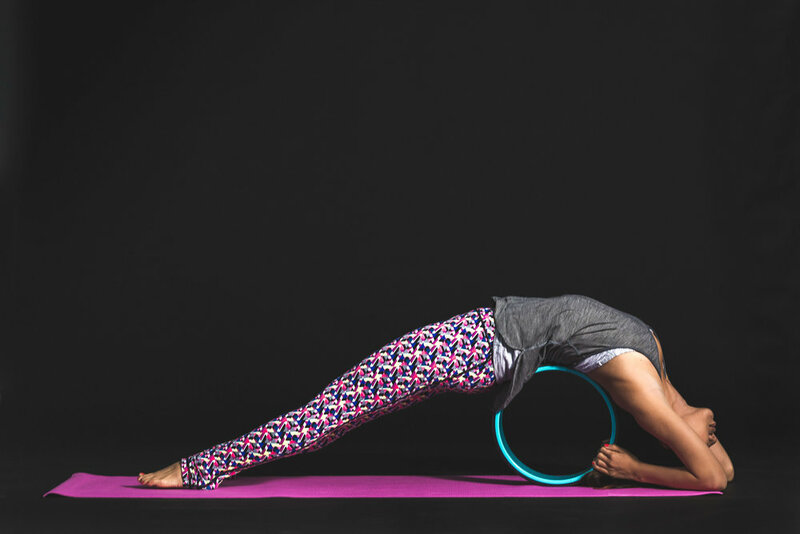 So, pick up that yoga mat because you know once you arrive at the yoga studio you are building healthy habits and building the right frame of mind. This in turn will develop a more positive mindset which will then stay with you when you leave the studio to continue with all your new healthy habits. 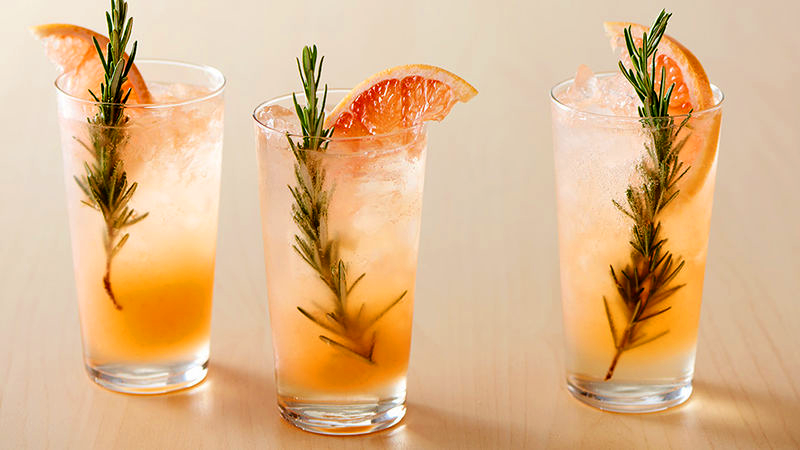 ‘Paloma Fizz’ Mocktail… Unique and refreshing with a hint of rosemary. To make the Rosemary Simple Syrup simply add the water and sugar to a pan, add rosemary, simmer and cook until all the sugar is dissolved before letting this cool completely. To make the drink pour grapefruit juice and simple syrup in a glass, stir to mix, add ice and top off with tonic water, garnish with a sprig of rosemary and a slice of grapefruit. It’s winter and I just want to snuggle under my blanket on the sofa and watch mindless TV or read my book with the log burner going…… Is that how you feel? 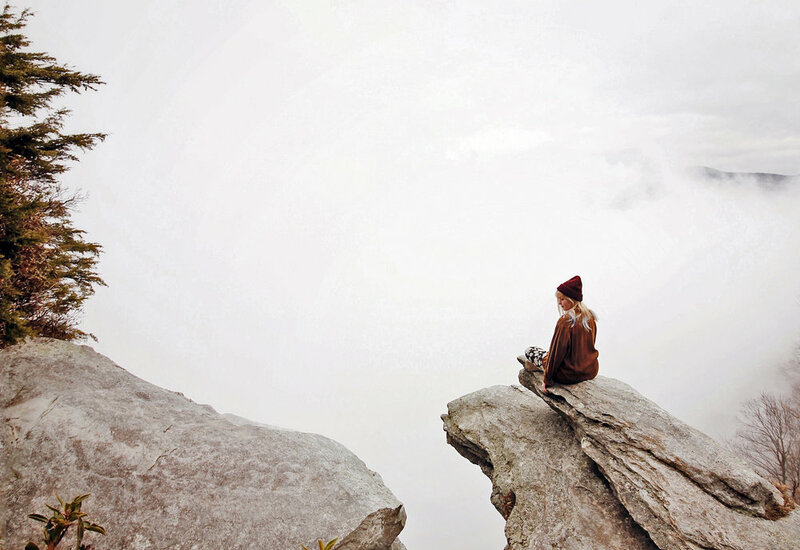 Wait, it is not good for us we need to keep moving and over the next few weeks we will look at why practising our yoga in the cold months is essential for our wellbeing. Aching joints? Flu and cold symptoms? No energy? Sallow skin? Mood swings as not enough sunshine? The list goes on as to why we need to get our mats out and practice. Seasonal affective disorder is common in the winter and is brought on by darkness and lack of sunshine, or, for some, we get the winter blues. We have no energy, feel tired, an increase in appetite. 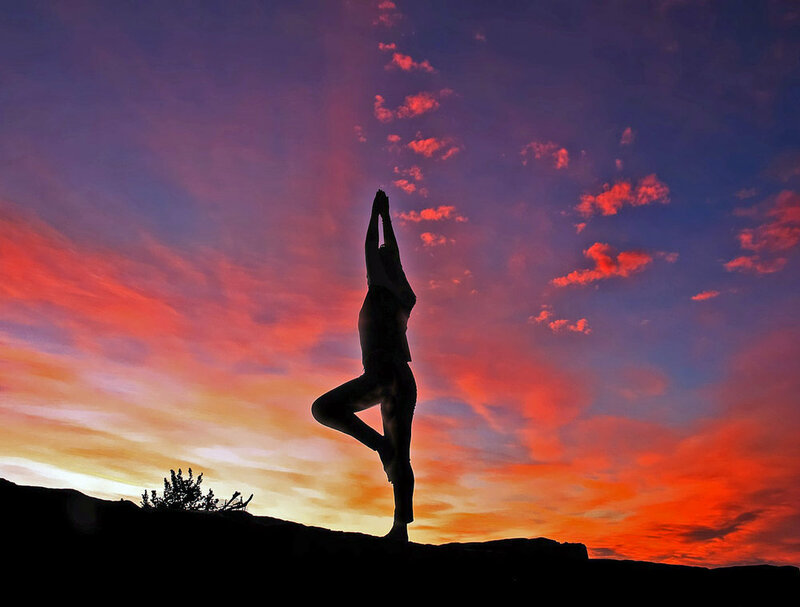 Yoga can help you alleviate these systems, by incorporating Sun Salutations into our morning practice, they build heat, increase our cardio capacity which then increases our energy and endurance which then rebalances our sleep-wake cycles, eating habits and digestion. If you are in a cold room, start your salutations slowly, with deep breaths, increasing the pace with your breathing as you move through the salutations. A good reason to start the day in an energetic way whatever the weather. I normally do a recipe each week, but life is about changes and I am passionate about mindful eating. We have all done it, eating whilst reading a book, or watching the television. Did we notice what we ate? Did we notice how much we ate? More importantly did we taste what we ate? I bet like me your answer is a big massive NO. I think again it is about shifting our mindset and making all our meals an event, yes, a wonderful moment to enjoy every mouthful……. I know, I know we don’t always have time…. But don’t we? Instead of eating our sandwich at our desk go outside and enjoy your sandwich in the sunshine, then go back to your desk. We all can take 10 minutes out of our busy routines to enjoy the food we are eating. We spend a lot of time focusing on our yoga, asanas and meditation. I now think it is time we also focused on our food, in the evening maybe we can linger and chat with loved ones, we can create a positive atmosphere, but let’s sit down and enjoy, savour flavours and focus on eating. By eating well, we know when we are full, which in turn will give us more energy, more positivity and keep us more satisfied. I love this tea, just a cup or two a day, it is just so good for you. Matcha is 100% green tea leaves that have been ground into a fine powder, this act makes is richer and more buttery in flavour. With healthy antioxidants, it also contains catechins which are the most potent and beneficial antioxidant, most widely recognised for cancer fighting properties. It also helps promote weight lost by speeding up the metabolism which in turn causes the body to use more calories (always a joy to learn), it also helps to lower type II diabetes risk, heart disease and it detoxifies the body. Health in a cup, must pop the kettle on. "Remember to take care of yourself, you can't pour from an empty cup." Fend off hunger, lower cholesterol, and boost fiber intake. With spring upon us already, I’ve been thinking! ‘Change of eating habits’ starting with something to fend off hunger, lower cholesterol, and boost fiber intake. Grapefruit is a citrus fruit and grows in clusters on trees, like grapes; ranging in taste from sweet to sour, and colour; yellow, pink or red. Low in calories and containing a host of nutrients. They're a good source of vitamin A, which is great for supporting the immune system, healthy eyes and skin. Folate, which is key for a baby's development during pregnancy, plus vitamin C, magnesium, potassium and calcium. Half a fresh grapefruit, counts as one five-a-day portion. The American Heart Association published a report that suggested that a diet high in certain flavonoids, found in grapefruit, may lower a woman’s risk of stroke and improvements in memory and cognition as well as the prevention of neurodegenerative conditions. Studies also tell us that specifically red grapefruit, can help to improve cholesterol blood levels, particularly in those suffering with atherosclerosis – a build-up of fatty material inside the arteries. 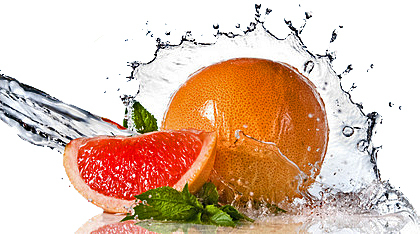 A word of warning: grapefruit can affect prescription medications? The NHS advises that fresh grapefruit or grapefruit juice should not be consumed with certain medications as it has been shown to perhaps reduce their breakdown and elimination, which can result in increased blood levels of the drug. These include, but are not limited to, statins, calcium channel blockers, immunosuppressants, certain cancer medications and Entocort, which is used to treat Crohn’s disease. Always check with your GP first if you're not sure! To be honest, I love this soup Spring, Summer, Autumn or Winter. 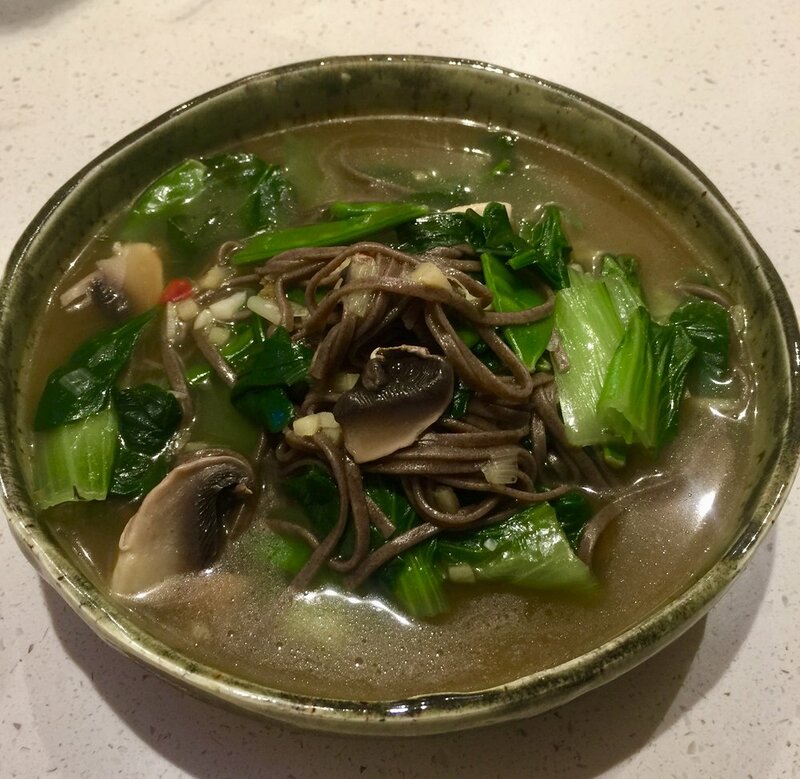 It is a bowl of goodness, excellent for the guts good bacteria and leaves me feeling healthy and full. It is quick and easy to make, I know it will become a staple. Soba noodles - the packet is normally sectioned into portions, if you can't find Soba noodles any noodles of your choice are great, you may need to adjust your timings. Spray some oil into the bottom of your pan and gently fry off the onion for 5 minutes, then add the garlic and fry off for a further 1 minute. Pour in the water and add the ginger and vegetable stock, bring to boil. Once boiling turn down the heat and let it all simmer and infuse for around 15 - 20 minutes. Bring back to the boil then add the noodles and green beans, set timer for 2 minutes, then add all of the rest of the ingredients for a further 3 minutes. Serve, you will need a fork and spoon to enjoy every last mouthful. Last week I said that over the next few weeks we were going to work towards a summer of being healthy and strong. 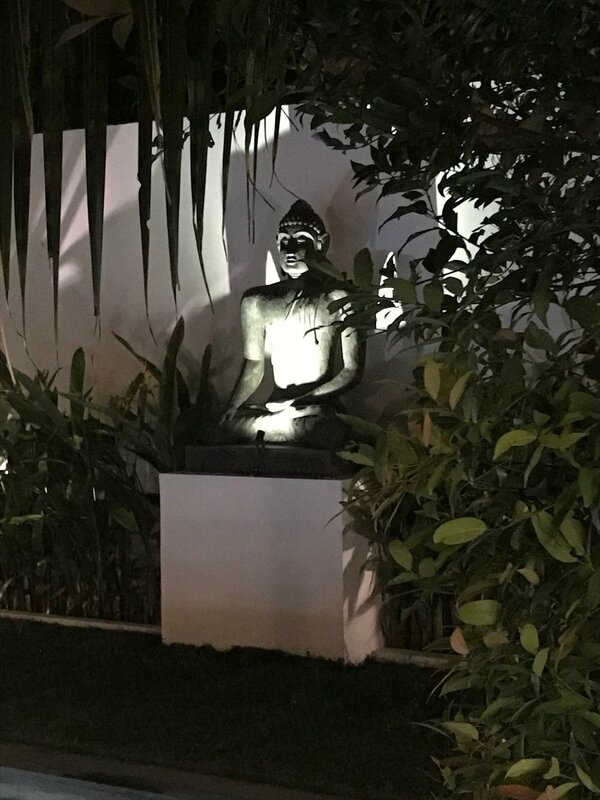 Well today we will start with our minds…… yes, such a powerful tool, our minds decide whether we are going to have a good or bad day, they are either half full or half empty and they do like to talk down to us……. It is time to stop the chatter and a time for all us women to stop the nasty self-talk. It is time for us to clear away the past and work towards a mindful, rich and rewarding future. So, this week take some time to spring clean the mind, let go of yesterday and work towards tomorrow, as the best in all of us lies ahead. As strong, determined women, ask yourself, “do I treat my body as I should do” such a simple powerful statement. So, let’s be mindful this week and think before we say, or do anything that may have a negative impact on ourselves, because if we are going into the summer strong, we need to start with our minds. 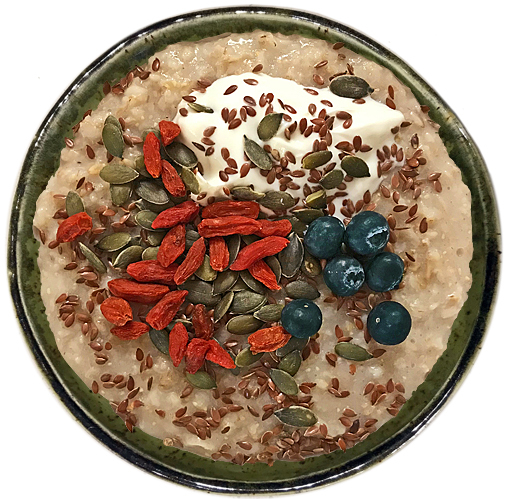 "Mindfulness is a way of befriending ourselves and our experience"
Porridge made with Organic jumbo porridge oats and water. Heat the oil in a large casserole or saucepan over a medium heat. Add the celery and carrots and cook, stirring, for 7-8 minutes. Add the leeks, cook for 3-4 minutes, then stir in the garlic and wine. Let the wine cook out and reduce for a few minutes. Tip in the tomatoes and lemon zest and season well. Add the stock, bring to the boil, then simmer fairly rapidly for 30 minutes, stirring occasionally or until the vegetables are just tender and the liquid has reduced and thickened. Stir in the beans (add a dash of hot water, if necessary) and cook for 5 minutes. Remove from the heat and stir in the oregano or thyme and the lemon juice. It’s worth re-checking the seasoning now. Spoon the casserole into bowls and garnish with fresh oregano or thyme leaves. 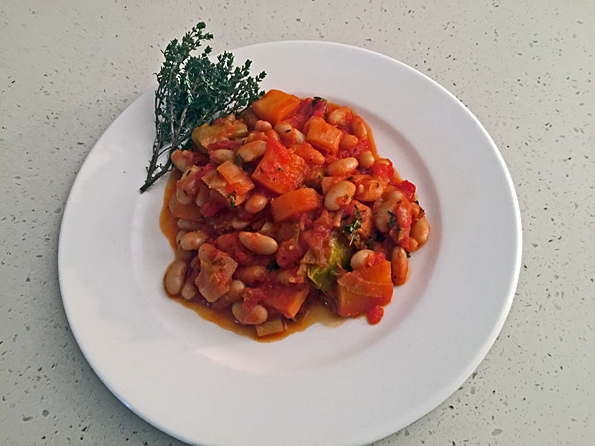 Delish… Beans don't have to be boring, this recipe is just so full of flavour. Heat a little oil in a saucepan, add the ground coriander and turmeric and sauté for 2 minutes, add garlic and chili and sauté for another 2 minutes. Add the onion and sauté for 3 minutes to soften. Add a splash of water if it gets too dry. Add the grated carrot and courgette and sweet corn, sauté for 2-3 minutes, add the beans and sauté again for a couple of minutes until softened, add a good pinch of salt, the chopped coriander and millet flakes. When the mixture is cool enough to handle, form it into 8 burgers, kneading to gently squash the beans a bit. 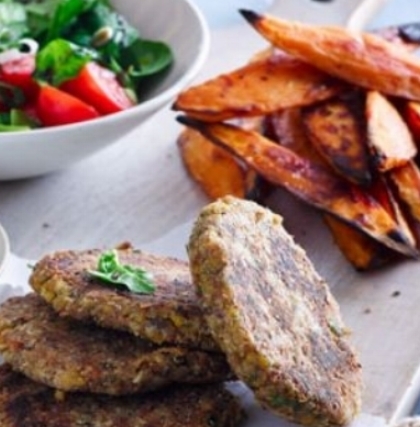 Spread a plate with millet flakes and coat the burgers, chill for 30 minutes. Fry in a little oil on each side to crisp up then transfer to the oven and cook for 20 minutes. "Recipe from the Honestly Healthy cookbook"
I know, can you believe it, the clocks go back this weekend and with darker days ahead it can become really difficult to stay motivated, when really all you want to do is dive back under the duvet for the next few months. It is now, when the weather gets colder, nights gets longer that we must keep up our yoga practice. As we know from my blogs on the benefits of yoga, controlled breathing, strong stretches, inversions and twists will keep our immunity high, our stress levels down and bring us serenity and optimism which in turn creates lots of laughter. So instead of diving back under the duvet with a large hot chocolate, lets work together this winter in keeping our spirits, immunity and optimism high. Roasted Butternut squash soup: A real easy autumn warmer, healthy and delicious; it's important to use good stock and season well to bring out the nutty and sweet flavours of the squash. Half lengthways, remove seeds and roughly chop the butternut squash and place in a lightly olive-oiled roasting tray, In a hot oven roast for 40 mins or until tender. In a little olive oil gently fry off the onion and garlic until soft, add the ginger and turmeric before adding the stock. Peel the roasted squash and add this to your soup before simmering for 20 minutes. I like to dry the seeds and fry them in a dry pan until well toasted for a nutty crunch on top. So I am sat on my landing looking out at the beautiful countryside sipping a delicious green tea, as I am watching the world go by (or in this case the cows), I thought what are the benefits to drinking green tea or is it all nonsense. Well it isn't nonsense it is actually loaded with antioxidants and nutrients that are just so good for us. Did you know it improves brain function, helps to lower the risk of cancer and fat loss. One of the compounds is the antioxidant Epigallocatechin Gallate (EGCG), this was studied and used to treat many diseases and one of the reasons it has been used for medicinal purposes. It is believed to help with Alzheimer's, lowers your LDL cholesterol, certain cancers and it can help you live longer. Wow, impressed....... let's keep drinking. "I want daisies in my hair, green tea in my hand and love in my heart"